More to see in Israel: Before or After your Group — Christian Travel Study Programs, Inc.
· In Jerusalem you need to be aware of whether a place is open on sabbath (shabbat). Sabbath starts at sundown on Friday and ends an hour after sundown on Saturday. Businesses and the light rail will close at least an hour before sabbath. Taxis will operate on sabbath, but at a higher rate. · Most restaurants in Israel are kosher, meaning they are either based on “meat” or they are based on “dairy”. (Your hotel dining room will be “dairy” for breakfast, and “meat” for dinner.) That means that you will not have any meat at breakfast (but you could have fish), nor will there be any milk products at dinner. If you are eating at an outdoor café, do not take food from one restaurant to the sitting area of a different one. · The hotel Reception desk will have a map of Jerusalem available. Ask them for one and/or ask them how to get to the place you want to go. Israel Museum houses the “Shrine of the Book” with a Dead Sea Scrolls exhibit, as well as an excellent archaeological museum and model of ancient Jerusalem. · Visit the Israel Museum, location of the Shrine of the Book; the large-scale model of the ancient City of Jerusalem; and many exhibits. · Visit the Tower of David museum, just inside Jaffa Gate (Old City). · Visit the Burnt House in the Jewish Quarter. · Ride the light rail: station is a block away from the hotels; use a credit card to purchase your ticket; stops are displayed in Hebrew, Arabic and English; be sure to validate your ticket. If you are interested in hearing an excellent teacher at a Messianic fellowship, Jerusalem Assembly offers something special. · Visit Ben Yehuda: use the light rail (or walk) and get off at the Jaffa Center stop. Cross the street and take a left on King George street to Ben Yehuda; take another left and wander down Ben Yehuda. The Tower of David Museum inside Jaffa Gate has a “Jerusalem through the centuries” overview exhibit. · Visit the Western Wall tunnels. Ask the Reception desk about booking a reservation/ticket. · Go to the City of David excavations, and walk through Hezekiah’s tunnel (wet). There is also a “dry tunnel” option. Ask the desk for information. · Go in the Old City via Jaffa Gate. The street straight ahead of you is David’s Street. Just past the plaza is a jewelry and souvenir shop on the left called Rex. Henry is the brother who runs the shop. The family are life-long residents of the Old City, and are Armenian believers. They are very interesting to talk with, and can be trusted as a resource. Tell them Joan sent you, and you will be treated as family! Few places illustrate abundance like the Mahane Yehuda market (shuk) in Jerusalem! 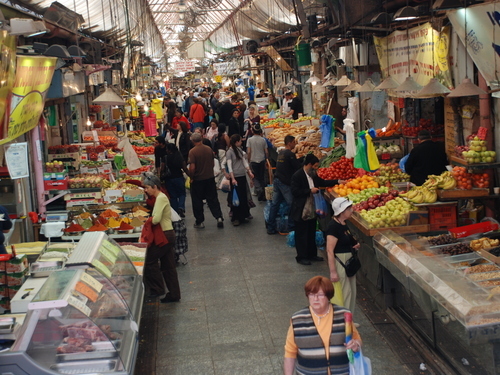 · Go to Mahane Yehuda (the Jewish open air market … “The Shuk”). Any day is interesting (except shabbat), but Friday early afternoon is a special cacophony of sights and sounds! It is an area between Jaffa Rd (there is a stop on the light rail) and Agripas Street … and several blocks wide. It has become a destination for people other than just the frugal shopper or the orthodox, with it’s trendy restaurants on the outlying edges. It is frequented both by tourists and locals. · Go to Yad Hashmonah, a kibbutz originally started by Finnish believers. The hillside setting is beautiful, and the biblical garden is worth the time to get there. (Recreated scenes similar to the original Scripture Garden.) It is serviced by infrequent public busses from Jerusalem. I think I took one from Neviim Street, but I don’t remember the number. Focaccia bread with three spreads is FABULOUS! · My favorite restaurant is Focaccia Grill Bar, and is open on sabbath. Food is great; prices are reasonable; and portions are large. From the Grand Court or Leonardo hotels, it is about a 30 minute walk … or take the light rail to the Jaffa Center stop, and then walk about 10 minutes from there … or take a taxi. · The American Colony Hotel is across the street and around the corner from the hotels we usually use, and is open on sabbath. It has wonderful food and a unique atmosphere, but the prices are high. (The quinoi salad I had recently was excellent!) Their main restaurant is downstairs in the winter (Val’s Brassier) and moves outside in the warm weather. · The Train Station is a recent “destination” project located south along Hebron Rd and is in the location of the old Turkish train station. It has a variety of good restaurants and shops. · BurgersBar is a chain that has burgers made of beef, or lamb, or a mixture. I love the house burger (mixture). Burgers are large, fries are good and both are large portions. (Don’t waste your money on the onion rings.) I often share a burger and fries with a friend. Note that there are several other stores that have similar names. The one I like has an “s” in the middle of its name. · Both the Leonardo and the Grand Court have reasonably priced food in their lobby bars. (Dairy and fish only.) I often use one of them for lunch. They are available on sabbath, but certain items on the menu will not be available on sabbath because they require cooking. · Aroma Café is a chain with great coffee, good sandwiches and basic food. Open on sabbath. · Falafel and shwarma are the Israeli version of fast food. 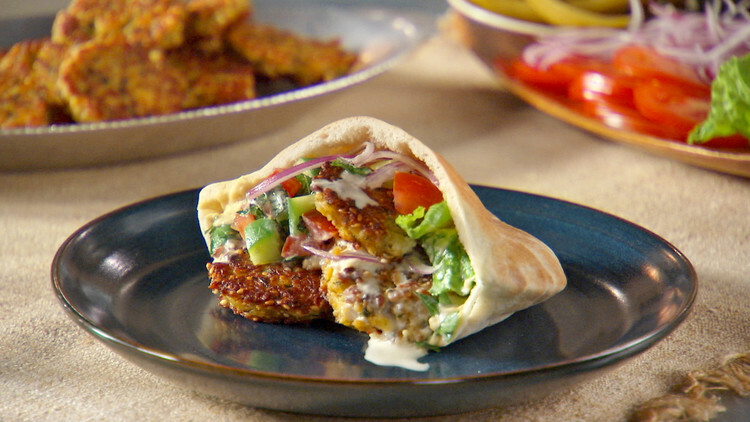 Falafel is ground and seasoned chick peas, and shwarma is turkey grilled on a spitz. Both can be put into a pita or laffa (super-size) and stuffed with raw salads. Each shop has it’s own flavors. These will not be open on sabbath. Israel’s “fast food” is the falafel! · Hummus with pita to dip is a common lunch (with raw onions & pickles ???). Abu Shukri in the Old City is the most famous. It is just a hole in the wall, but your taste buds will never be the same! · You can always go to the Old City for food. Everything there (except the Jewish Quarter) is open on sabbath. There is a great variety of options in the Jewish Quarter (closed on sabbath). If you want to eat in the Arab areas, I’d suggest you to inside Jaffa Gate and go to the Rex shop (Henry) and ask for his recommendation. He is conscious of good local food, and also cleanliness. · The restaurant at the YMCA is very good, and I think it is open on sabbath. (not kosher) It is about a 30 minute walk from our usual hotels. It is located across the street from the King David Hotel, and the building is unique, so you’ll want to look around. · If you want to include a unique event, go to the King David for coffee or tea. It’s expensive, but you’re paying to be able to say you had coffee at the King David!